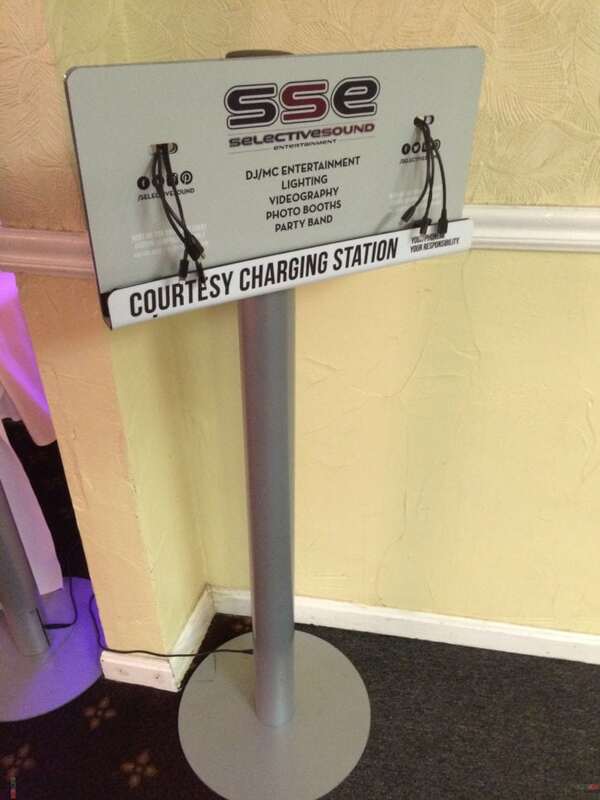 Custom Wedding Charging Stations Keep the Photos Coming! Keep your wedding guests connected with this modern amenity…Selective Sound courtesy wedding charging stations! By the time your wedding reception starts, your guests phones will most likely be in need of a serious charge. Not only have they been taking numerous pictures of your beautiful ceremony but they probably uploaded them all to social media for you. Therefore, they are going to be looking to plug in. Rather than having your guests searching the walls for awkward places to plug in why not provide them with convenient wedding charging stations? You’ll have no worries with SSE’s custom charging stations. First of all, they are rather small in size. Therefore, you won’t have to worry about them taking up a bunch of space or distracting from your gorgeous decor. Also, these are quick charge stations with I-phone, Android and mini USB cables. Yes, there are thousands of posts on Pinterest about creating your own. But do you really want to add another to thing to your to-do list? More than likely, this answer is no. So why not save yourself some time and stress and let Selective Sound take care of this for you. You want it customized just for you? No problem! We have you covered!